Roger Woodward is full of rapturous praise for performances in San Francisco by pianists Alexander Gavrylyuk and Edward Neeman. For the past year, the mother of all earthquakes was predicted along the San Andreas fault and on March 25, the big one struck, and again on May 20, when the City of San Francisco was plunged into a state from which it will certainly take time to recover. 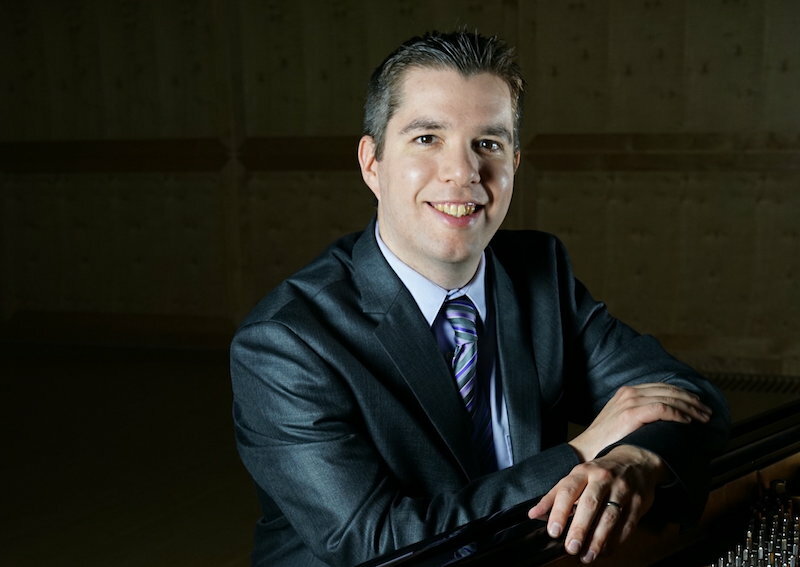 Two 34-year-old immigrant-Aussie pianists were responsible – Alexander Gavrylyuk, who currently lives in Amsterdam with his wife and daughters and Edward Neeman, who recently took up residency in Canberra on its ANU campus with his wife and son. The polaric opposites were born in 1984, less than a month apart, in the USSR and North America, and for their San Francisco debut appearances, performed within a few blocks of each other – Gavrylyuk, at the recently refurbished Herbst Theatre, Van Ness Avenue, (where the original United Nations Charter was signed) and Neeman, at Nob Hill’s magnificent First Old Church, in Sacramento Street. Except for a handful of cities including San Francisco, it has become an increasing rarity to sight students, pianists and teachers alongside non-specialist music lovers, clamouring for box-office cancellations. But following Neeman’s stunning debut and judging from the keen anticipation preceding Gavrylyuk’s appearance, the scrum which my students and guest witnessed on their way into his concert, came as no surprise as they made their way through a huge, excited crowd. Months before his arrival, Gavrylyuk had been advertised as the first-prize winner of the Hamamatsu, Horovitz and Arthur Rubinstein International Piano Competitions but it proved more helpful to music lovers (and management) when he also began to be advertised as having recently taken Europe “by storm” since he had, presumably, a good deal more to offer than yet another prize winner. Over the past 16 years, San Francisco audiences became increasingly jaded about heavily publicised, competition winners but those of us who had followed Gavrylyuk’s succession of artistic triumphs already knew that he belonged to another league and that we would be thrilled by what turned out to be a shattering debut. Such a term as “debut” could, easily, be misleading given that for the past ten years Gavrylyuk has been busily establishing himself at leading festivals and with most of the major orchestras. But “debut” it was, and his performance certainly provided an invigorating sense of renewal for the Civic Centre’s endless plague of predictable winners and manicured performances. Unaware that six other Steinways had already been offered him, I resolved, the day before his concert (on the same stage), to try to keep ProPiano’s Steinway in reasonable shape for his recital as my colleagues of the Alexander String Quartet and I wrapped up our Shostakovich cycle for the season. As it turned out, he had, perhaps inadvertently, chosen the very same instrument on which I had performed concerto performances a few months earlier, so the City’s top piano technician reported. In any event, he was certainly put through his paces for the Gavrylyuk recital and as my students and colleagues discussed the chosen instrument and waited for the artist to appear, the Herbst Theatre lights dimmed and the one-man storm-squad strode out onto the stage. He launched straight into Busoni’s Mesozoic transcription of Bach’s early organ Toccata and Fugue in D minor, BWV 565 (c.1704/c.1900) with the accuracy of a guided missile. It was, however, the infectious charm and spirited humor of Haydn’s B minor Sonata Hob.XVI/32 (1776) which offered him the perfect vehicle to apply his wide palette of judicious soft dynamics, regular-irregular phrasing, varied legato, non-legato and staccato touches, and the opportunity to syncopate the Presto’s crisp rhythms and voice counterpoints. He enthralled my students with his elegant cantilena and ravishing, highly articulate embellishments which recalled birdsong from the crystalline air of a primeval forest. Throughout the Haydn, Gavrylyuk also reminded us of the importance of varying detail in the art of the repeat – a traditional practice which had been passed on by mid-Baroque-era performer-composers to successive generations: Alessandro Scarlatti to his son, Domenico; Louis Couperin to his nephew, François; Johann Christoph Bach to his younger brother, Johann Sebastian who handed the venerated art on to his sons, Carl Philipp Emanuel and Johann Christian, before the art of the repeat reached Sammartini, Michael and Joseph Haydn, Mozart and Schubert. With searing musical insight Gavrylyuk shared the intimate poetry of six of Chopin’s Douze Etudes Op.10 – Nos 3, 8, 9, 10, 11 and 12, not in a performance more typical of the vain, empty glitter of a circus stunt but with love and respect for the Chopin aesthetic and sonority. For once, it was possible not to be confused whether Chopin’s Etudes might have been composed by Franz Liszt. Although Gavrylyuk is perfectly capable of performing mind-boggling circus stunts he tends to serve them, more appropriately, as the petits-fours of his own entertainment. After interval, the odyssey continued with Skryabin’s luminous Sonata No 5, Op.53 (1907) which the artist linked with subtlety and care to the legend and appels mysterieuses of the composer’s Fourth Symphony – the Poem of Ecstasy Op.54 (1905-08). Gavrylyuk deployed an orchestral sonority close to the work’s symphonic textures and in this respect (as well as others) his performance emerged as more of an orchestration than those enshrined by Gieseking, Sofronitzky and Richter. Following San Francisco’s recent surfeit of Fifth-Sonatas, Gavrylyuk’s penetrating musical insight was not only welcome but reminded us of a rapidly vanishing order of conceptual and performing priorities which are in urgent need of protection. Languorous dreams worthy of Pushkin or Blok revealed shimmering surfaces and sensual textures hovering between tender yearning and abrupt, violent Skryabinic volandi which surged across the entire keyboard. Tight rhythmic control and fastidious attention to detail were exemplary. Three Rakhmaninov Preludes Op.23 No 1, in F-sharp minor (1903), No 5, in G minor (1901) and Op.32 No 12, in G-sharp-minor (1910) offered tantalizing glimpses of Levitan’s Russian steppe. Their exquisite, burnished textures, together with the Bach, Haydn, Chopin and Skryabin proved, however, to be no more than a mere clearance of the throat before the artist closed his recital with a sublime performance of the composer’s three-movement Piano Sonata No 2, in B-flat minor, Op.36 (1913, revised 1931), one of several works for which Alexander Gavrylyuk stands unrivalled. His alert, thoroughly-researched account placed striking emphasis on the composer’s deft inter-movement weaving of thematic material and building of incremental layers of counterpoint to provide an impressive organic unity. Counterpoints in the Bach, Haydn and in the paysage of the central development of the G-minor Prelude had prepared him well. Fifteen years of constantly refining the Haydn B minor and Second Rakhmaninov Sonatas had also prepared him well, a period during which I was constantly reminded of Rubinstein’s admission, of how it had taken a lifetime to perfect a handful of pieces. Gavrylyuk’s early decision to develop his big-boned, minimally-nuanced conception of the Rakhmaninov Sonata, paid handsome dividends over the long term as his recent San Francisco recital confirmed during which essential differences between his granitic, intellectually vigorous conception and the more cosmetic, of his contemporaries, became evident. Whereas many pianists tend to present Rakhmaninov’s Second Sonata as a lollipop, Gavrylyuk takes his audience on a pilgrimage to heights more appropriate to the gravitas of Rakhmaninov’s mature creative development. Saccharin, inchoate perceptions which condemn a masterpiece to little more than a hybrid of the composer’s early-nineteenth-century inheritance are, quite simply, not part of the Gavrylyuk DNA. In San Francisco he presented Rakhmaninov’s Second Sonata not solely as a Chopin derivative but as the historical outcome of a series of significant 17th and 18th century references which extended from Corelli to Couperin and Bach, and in an aerial view which embraced Borodin, Tchaikovsky, Rimsky-Korsakov and Glazunov. Gavrylyuk’s broad and well informed vision also paid homage to Taneyev whose equally significant impact on Rakhmaninov (until as late as 1915) is rarely appreciated. Gavrylyuk nurtured the work’s rich imagery and contrapuntal sinew without ever encroaching on its radiance and serenity. At the cataclysmic point where all forces meet and the work ascends to the Allegro molto’ssummit, it was clear that this work emanated from the artist’s deeper musical being. It was not simply part of him but the very essence of the artist’s soul. I sensed that the audience had realised it was privy to the performance of a lifetime and was sharing the privilege of witnessing two simultaneous and profoundly moving cultural dislocations, of artist and composer. At the work’s highest dramatic point the two became one; indivisible, as time stood still and I felt the ground move under my feet. From beginning to end, the great artist was absorbed in his task, barely moving a muscle except to adjust essential back or shoulder weight. He maintained his classical posture throughout with unflinching keyboard focus as he systematically enveloped his audience in strategic layers of symphonic sound, exploiting the hall’s magnificent acoustics to full advantage. A blur of rapidly concentrated hand movements brought the miraculous achievement to a close before the audience leapt to its feet cheering him to the rafters. Gavrylyuk acknowledged his deafening ovation and seemed to walk off surrounded by a light energy, touched that his audience wished to share such a special moment with him. His modest, unassuming stage manner endeared him to San Francisco’s music lovers as endless applause followed two encores each of which thrilled his audience to the core. He could, easily, have performed half a dozen more but instead, received many of his devoted audience in the Hall’s vestibule. He had performed the evening before and would perform again the following evening but nevertheless, took time to greet hundreds of well-wishers and enthusiasts. As the temporal pace of reality gradually returned, my students, guest and I reluctantly left the Gavrylyuk galaxy on a little Skryabinic cloud as I recalled Stravinsky’s description of Rakhmaninov: “a six-and-a-half-foot scowl“. But after Gavrylyuk’s inspired performance of his Second Piano Sonata, Rakhmaninov could only have been grinning from ear to ear. 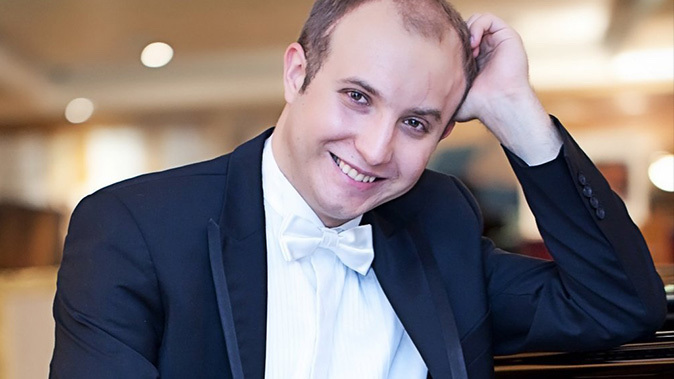 Two months before Gavrylyuk’s San Francisco debut, Edward Neeman, first-prize winner of the Joaquin Rodrigo and Carlet (and several other) International Piano Competitions, embarked on a journey of a very different nature and, like Gavrylyuk, proved to be no mere prize winner. While many claim (and with good reason) that Gavrylyuk has donned Horovitz’s mantle, Neeman belongs to the auspicious tradition of Serkin, Tudor and Kirkpatrick. Perhaps the best known work on his uncompromising, almost ascetic San Francisco debut program was one which Chopin, Schubert and von Weber had probably admired – Jan Ladislav Dussek’s tempestuous four-movement Sonata in F minor, Op.77 (1812) which Neeman addressed with flawless technical authority. Without batting an eyelid Neeman demolished Dussek’s heavy-laden outer – movements with laser-like articulation. His dry-eyed approach to the lengthy recital veiled a searching musical intellect and keyboard mastery in the service of Art which place him on the highest echelon of emerging international musicians. Neeman’s program continued with Paul Schoenfield’s neo-Baroque suite entitled Peccadilloes (1996) in which five light-hearted, contrapuntally inventive movements, sprinkled with cocktail harmonies and piquant twists, were placed in the order of: Fughetta, Rag, Waltz (with passing references to Ravel’s Tombeau de Couperin) , Shuffle and Boogie. Neeman despatched the exacting Nancarrow-rhythms with undemonstrative panache and finesse. The second half of this debut was devoted exclusively to Larry Sitsky’s First Piano Sonata which the composer dedicated to Neeman in 2009. Entitled Retirer d’en bas de l’eau, the first (of four Sitsky Piano Sonatas) bids farewell to an adaptation of sonata form in textures which at times, verge on updated late-twentieth-century chromatic saturation. The work’s legend is closely aligned to the Vodoun ritual of reclamation which transports spirits of the dead back through Waters of the Abyss into the world of the living for preservation in large earthen jars to watch over their descendants. Sitsky’s magnum opus was dominated by frenetic bursts of keyboard drumming, batteries of percussive clusters often simultaneously combined with complex, contrasting rhythms; pulsating, disparate chordal progressions and unwieldy boulders of massed sonorities which resounded throughout a clear if generous acoustic. At times the aural confrontation was so intense that it seemed everything but the proverbial kitchen sink was being hurled at the unsuspecting audience and, as it turned out, the sink as well. Violent barrages of sound bombarded us in prolonged bursts as entrapped spirits were unleashed and a Satanic grip took hold in forbidding clouds of despair, swirling around the high ceiling and and sacred artefacts below. They began to shake as the first of a series of San Andreas rumblings commenced beneath our feet. Together with the damned, I found myself pinned to my seat; doomed and staring at a hymn board, wondering if prayer might save us before the jaw-dropping, Gogol-ic, tour de force moved into its final stages like a hideous, winged juggernaut. If Sitsky’s keyboard Krakatau provided the highest dramatic point of Neeman’s unyielding recital, then one of its more impressive aspects enabled his audience to witness the piano go out of tune and return back into tune again just before the overwhelming onslaught came to a standstill. A beleaguered audience sat stunned; bewildered, as the artist placed finishing touches to the epic and our ears found themselves, unexpectedly, in a little clearing. If blessed by the anodyne of an unusually prolonged silence, San Andreas returned to cue applause but audience and artist were lost in the celestial calm which had followed the Sitsky before a trickle of applause began here and there. It gathered momentum, before turning into a torrent, then flood which showed no sign of receding until the artist finally returned for an encore. Shafts of afternoon sunlight streamed through stained-glass windows to the earnest strains of Fanny Mendelssohn’s O Traum der Jugend, o Goldner Stern, Op.6 No 3 (c.1817), to cleanse and provide comfort rivalled, perhaps, only by the Victorian furniture. Dazed survivors groped their way out of the main body of the church to the refreshments counter as I contemplated how long Neeman might remain on the piano technician’s Christmas-card list although Sitsky’s fate struck me as equally dubious. By then, however, I was facing my own dilemma, to decide whether or not it was the composer or the performer who was the true genius. For more than half a century, Sitsky maintained a strong connection with San Francisco where he had studied 1958-1961, with the Busoni pupil, Egon Petri. In 1988-89, Sitsky, the Fullbright scholar had donated his celebrated library on reproducing piano rolls to Stanford University. An equally celebrated publication Music Of The Repressed Russian Avant-Garde 1900-1929 is currently in its seventh printing and has since become as internationally acclaimed as his formidable opera The Golem, which had been premiered in 1993. Sitsky’s prolific body of solo keyboard works are performed worldwide as is his prize-winning First Piano Concerto (Twenty-Two Paths Of The Tarot), which had been composed in 1991. The work was premiered in 1994, at the Sydney Spring International Festival of New Music and was subsequently broadcast on twenty-four radio networks worldwide as the direct result of a 1995 Paris UNESCO award. One of the composer’s more recent works, completed in May, 2018, is Doctor Faustus, an eight-hundred-page opera, after Thomas Mann. As for Sitsky’s brilliant former student, Edward Neeman (who was a postgraduate student of Paul Schoenfield and Solomon Mikovsky), I had already experienced his highly-charged performances of Tchaikovsky, Bartók and Sitsky’s Second Piano Concertos; Shostakovich’s First Piano Sonata Op.12, Xenakis’ Evryali (1973) and an impressive repertoire of more recent works. Neeman’s San Francisco debut however, eclipsed all previous impressions except for a lingering memory of his live 2004 performance in Panama City, of Liszt’s Etude transcendental No 5 – Feux follets – which might well have left the Kapellmeister himself in a cold sweat. The artist’s spectacular recording of ten Rakhmaninov Etudes tableaux and infamous Sitsky Piano Sonata No 1, should not be missed, or Neeman’s recording of Chopin Etudes Opp.10 and 25, Mazurkas and the Rodrigo Piano Concerto which are available on-line via MusOpen. In a city surrounded by dedicated Bach festivals and renowned for the quality of its new-music presentations, visual art exhibitions and the US’s premier early-music concerts, Edward Neeman’s debut was declared, almost overnight, a sensation. The 2018 season’s dark horse delivered a virtually inaccessible program by heart, with alacrity and ease. He introduced each of the unknown works himself in an urbane, slightly erudite bedside manner and with convincing charm. Those who were fortunate enough to witness his electrifying San Francisco debut may still be heard discussing its endless merits. Alexander Gavrylyuk hurls Brahms' furious musical thunderbolt in the second instalment of the SSO's mini festival. The virtuoso pianist received rave reviews for his Proms debut in August. Now he has recital concerts in Australia. Eminent Australian pianist Roger Woodward takes his hat off to the genius of Alexander Gavrylyuk. The pianist talks about the challenges of Rachmaninov, surrendering to the music, and being one with the orchestra. The series celebrates its 25th birthday with the help of Lane, Abduraimov, Cooper, and Gavrylyuk. The AFC presents three festivals, a piano series, cocktail concerts and more as redevelopment work continues in 2107. ★★★★½ Gavrylyuk stuns in knife-edged journey to Austria, France and Russia. The Brisbane-based concert series will present four international pianists in a series of stunning recitals. The Theme and Variations Foundation celebrated their third annual fundraiser with international pianist Alexander Gavrylyuk.